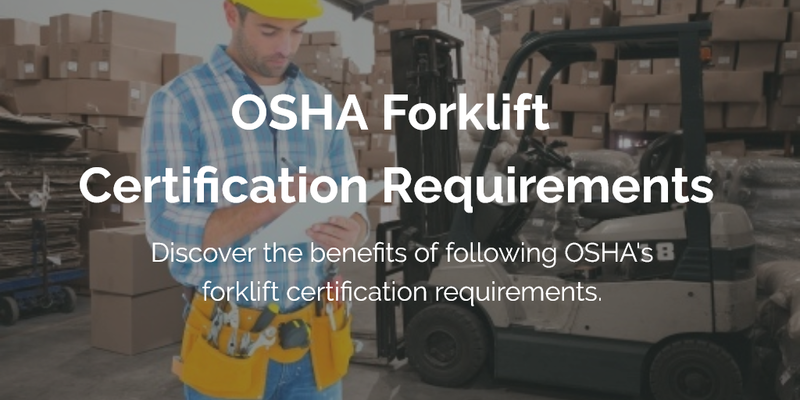 OSHA Forklift Certification Requirements - Be OSHA Compliant! OSHA requires every forklift operator to have safety training. You probably already knew that. 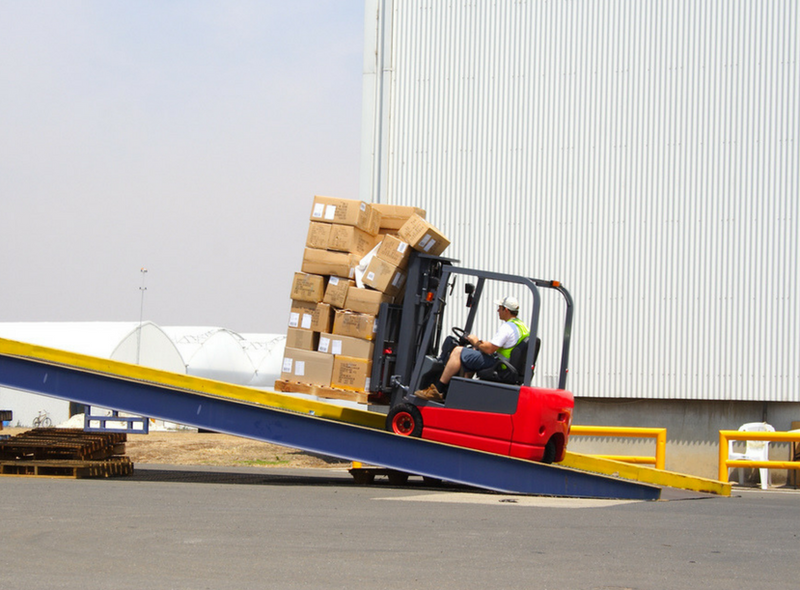 If you’re involved in a forklift accident, an OSHA investigation will look to see training records, safety related coursework, and other records related to your training. Employers are responsible for this training – which means they have to provide training and certification. Violating OSHA’s certification requirements can cost you thousands of dollars. It’s not worth the risk! 1. Experienced and Trained Operators are the only ones who can supervise and evaluate amateur operators. 2. Evaluation can only occur in a safe environment. 3. Training should consist of formal instruction, practical training, and an evaluation. ✓ Classroom testing and training. In this part of OSHA forklift certification requirements, every forklift operator takes a test to learn new safety skills, gain more knowledge about workplace hazards, and other helpful information. This testing period usually follows a defined study and preparation period. ✓ Hands-on, onsite evaluation by your employer. Once you’re out of the classroom, it’s time to put your new knowledge to the test. OSHA guidelines require an onsite evaluation by your boss or job site safety supervisor. This phase of the forklift certification requirements process allows your employer to see how well you operate a forklift in real-world, actual working situations. 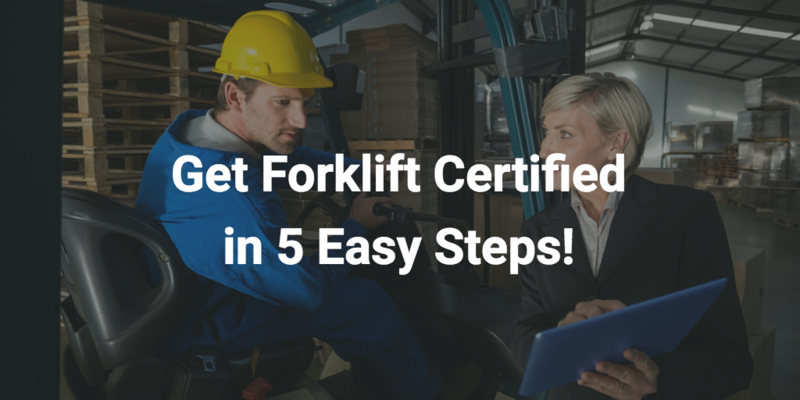 CertifyMe.net provides everything you need to meet OSHA’s forklift certification requirements – all in 5 easy steps! Be Compliant in 5 Easy Steps! No Charge to set up your company in our system. There are no books or videos to buy, costly training facilities to rent or special times to schedule. What Are the Consequences for Not Following OSHA Forklift Certification Requirements? According to OSHA under the Occupational Safety and Health Act of 1970, any employer who willfully or repeatedly violates any standard or rule described in this Act, including not meeting forklift certification requirements, may be penalized with a fine of not more than $70,000 for each violation, and not less than $5,000 for each violation. Any employer who willfully violates a standard, rule, or regulation set by OSHA and the violation causes death to an employee, such as neglect to provide a safe working environment or training, can be convicted by a fine of up to $10,000 or by imprisonment of up to six months, or both. If an employer is convicted of a violation twice, their punishment may include imprisonment of up to one year, a fine of up to $20,000, or both. OSHA forklift training requirements are put in place for a reason – to keep every workplace as safe as possible. Responsible forklift driving starts with the right training. From OSHA’s forklift training requirements all the way through successful course completion, CertifyMe.net is the only training partner you need to keep everyone at your company OSHA compliant. As you can see, OSHA takes violations very seriously by matching them with equally serious penalties. It is their duty to help ensure safe working environments for all workers, and to make sure that employers provide what they need to protect their life on the job. If any of your employees have not received their OSHA-compliant forklift certification yet, head on over to CertifyMe.net right away to create an account and get your workers signed up and ready to complete their certification in minutes. It’ll only take your employees about an hour to complete their forklift training, and to meet all OSHA forklift certification requirements. What do we cover to ensure you meet forklift certification requirements? What classes do we teach to qualify workers for forklift training requirements? Each course costs only $59.95 and comes with lifetime access to the training modules and free three-year renewals for life! CertifyMe.net online training covers all OSHA requirements, and includes recertification training so workers can easily recertify at any time throughout their career. If you have any questions about forklift certification requirements, OSHA training, or if you’re ready to become compliant today, contact CertifyMe.net today. You can also call our OSHA forklift certification requirements experts at 1-888-699-4800. Don’t put your safety program on hold any longer. If you need assistance with OSHA forklift training requirements, we can help today. Thanks for visiting CertifyMe.net. We look forward to handling all of your forklift certification requirements needs.